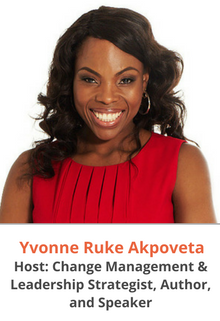 Meet Yvonne Ruke Akpoveta, OliveBlue Inc.
Change Consultant, Leadership Coach, Speaker and Author. She is an Organisational Change Management Consultant, Certified PRINCE2 Project Manager and certified John C. Maxwell Coach, Speaker & Teacher on Leadership principles. She holds a BSc honours in Business Information Technology & Marketing from London Guildhall University, and an MBA with Warwick Business School, England. Her international experience in Europe, Africa and North America has afforded her exposure to diverse business environments and a proficiency in thinking outside the box. She is also a published author, and an Inspirational and ‘Tell it like it is’ speaker, who is passionate about helping individuals, entrepreneurs and organisations drive change and achieve their goals.